Membrane Masters is a one-stop shop for all your Membrane Switch needs. No matter whether you are interested in bespoke one-offs, through to small quantities and large batches we offer a complete service from design to production. Membrane Switches are, as the name suggests, ultra thin electrical devices for use in low voltage control applications. Put simply an electrical circuit is printed, using conventional techniques, on to a pair of clear membranes which, when pressed together, form a make/break switch. This 'filling' is sandwiched between a base substrate for mounting the device on equipment and a Graphic Overlay which forms the user interface with its symbols and control areas - finger-pads if you like. Because there are no conventional moving parts these neat little devices are robust and reliable over many millions of operations. The connection between the Membrane Switch and the equipment controlled is by an Industry Standard ribbon with conductors at .1 inch pitch. Naturally many applications require more than one operation but the complete flexibility of the Membrane Switch technology makes it possible to combine many functions into a Membrane Keypad of virtually any shape or size. Conveniently there are no constraints on the size on any particular interface area meaning that key functions, for example an Emergency Stop Button, can be given both graphical and tactile prominence. Membrane Keyboards are an obvious choice for more complex systems and can be produced to include apertures for VDU displays and LED indicators. We can also produce keyboards that can be wholly backlit for use in situations of poor illumination as well as versions which have concealed engineers' controls too. The model in the picture on the left has embossed keys - another useful feature for reliable and positive use in critical situations. Obviously in use the Graphic Overlay is the most vital component and this is where Membrane Masters comes into its own. Yes the switch has to be easy to use but for many applications they also have to be pleasing to the eye. Our many years experience in all kinds of colour printing means that we can offer a design and production service that makes our products straightforward and easy to use while looking good too. Crucially we can include full colour logos and branding as well as laser cut details and special finishes. As specialists in Screen Printing we can produce graphics of exceptional quality and finesse. But that's not all, we are also experienced in Pad Printing and both Laser Engraving and Printing on virtually any material. This means that we can manufacture Membrane Switches mounted within Engraved or Printed conventional fascias. We can also supply single switches inset within any material. Many years producing bespoke promotional items in a variety of materials has made us specialists in Embossing and the production of artwork required for this intriguing process. For many switching applications we recommend embossed finger-pads, often in conjunction with special coatings such as an anti-slip finish. If you have a special need just ask for advice. Information display is a common requirement on Control Interfaces and the printing processes we use mean that Clear Windows are easily provided within any Graphic Overlay irrespective of the finish used. We can also supply specially printed windows which can be backlit to highlight particular functions or to indicate faults and are only visible in specified operational situations. Commonly our Membrane Switches are simply one component in equipment produced by others making working with precision to tight specifications vital. Obviously our Laser capability makes us ideally suited to such tasks but for high volume work we also have facilities for Precision Die Cutting - also a very practical solution for some types of substrate component. In addition to simple Embossing we can offer a number of Tactile Platforms including raised rims and buttons. Additionally spacing layers can be added if a very positive finger action is desirable to prevent accidental or 'nuisance switching'. Ask for advice. Some electronic devices can emit or be affected by receiving low level Electromagnetic Interference if they are not properly protected. For these applications we are experienced in manufacturing Membrane Switches with a conductive substrate base for effective Rfi Screening. Quality Control underlies everything we do. 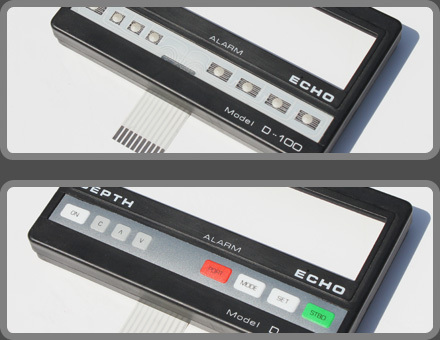 All our Membrane Switches are tested and proved throughout the design process. Although the technology is both proven and reliable testing programmes can be implemented during the production process if our clients require this service. Lead times depend of course on the amount of design work required and batch quantity but typically we can deliver within three weeks from the initial enquiry. Your own Artwork? No problem. If you want branding, logos or your won complete interface layout just send us the file. We can handle most formats but please check first. Membrane Masters can supply complete, or simply print, a variety of Keypads. Looking like an 'Airfix Kit' Injection Moulded Buttons linked together by sprues are ideal for mounting behind die or laser cut panels. Rubber Keypads, which we screen print, are highly robust - the smaller was for a radio interface to be used in extreme weather conditions. Although not expressly designed for Membrane Switch applications all these types could be used with the ultra thin technology. Need to highlight, or offer a tactile indication of discrete keypad areas? Rim Embossing combined with well designed colour printing is often an ideal solution. Here each key's square edge is raised through embossing and highlighted by solid colour. Economically using Blue ink both solid for the rims and as a highlight enables one colour to perform two purposes. Obviously keys and buttons must be designed for arduous use. Performing perhaps millions of individual operations over their design the symbols and legend must have lifetime legibility. While engraving would be the method of choice it's impossible with some materials. Step in conventional printing, often protected by a coat of varnish for added durability. We've decades of experience in finishes for normal and specialist applications - whatever the need we will find a solution that looks good and goes on looking good - for years. This detail view of a silicon rubber mat shows the very fine tolerances we can work to. This complete Membrane Switch Panel is actually a combination of the Membrane Switch Technology fitted to pre-cut metal escutcheon as a robust sub-assembly. As well as the use of three solid colours we also used translucent inks for the digital display apertures. Membrane Masters are experienced in such hybrids and can undertake individual processes, like Graphic Overlay production, to the complete job. Usefully, especially for last minute 'mods', we can screen print on pre-pressed and assembled components as shown here. This customer required a logo on a pre-formed switchplate panel with raised edges. We made a special jig and screen for the purpose. Button Arrays are a typical job for us and comprise a combination of pre-coloured injection moulded keypad with screen printed details. Arrays can be produced from customers' drawings with base tints in the injection moulding to guaranteed Pantone® colours. They'd then be returned to us for detail printing and finishing. For durability this simple Membrane Switch Fascia Panel was supplied with recessed colour keyed labelling. Laser cut in our factory the letters were hand inked and finished. Rim Embossing is equally suitable for marking out individual keys or panel areas - often in conjunction with spot colour highlights. Ingeniously here the Rim Embossing in black is bordered by a non-raised orange detail for additional emphasis - as well as looking smart too. Dome Embossing may only raise the surface of the graphic overlay 0.22mm above the rest of the panel but, as this close-up shows, that's plenty to both give a pleasing aesthetic effect and provide a positive location for the finger-tip. The Base Substrate of a membrane switch is frequently an adhesive film allowing the device to be firmly fitted to equipment easily and permanently. Here the backing is being removed on installation revealing the printed circuit of the device. The special adhesives used provide a secure waterproof seal. Membrane Masters is the place for both standard and one-off solutions. Take this attractive switch panel with transparent window. Although, as the name suggests, dome embossing usually aims at a circular raised key, other shapes are also possible. This customer required a square profile for which we designed a special tool, shown here under the graphic overlay. In emergency or where crucial operations require a clear switch 'target' there's really nothing to beat the traditional push button. We can supply or simply print all kinds of switch button - these were also engraved and recess coloured for durability. Tactile Feedback - knowing you've hit the button - is easily achieved on Membrane Switches by embossing and different types are shown here. For a very positive feedback that the switch has worked the 'in and out' movement provided by Dome Embossing - a circular raising of the centre of the key - is recommended. Rim Embossing on the other hand is ideal for marking discrete areas of the keypad.